I got thinking about how to share the Kindspring message. First the “surprise heads-up” - a dollar bill lying face up on the floor of a lonely isle in the local thrift store. 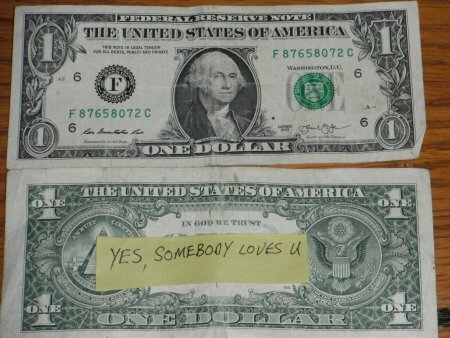 Then the "message" sticky posted on the back of the dollar bill - “Yes, somebody loves U". Ok, it's only one little message in a big pond. But the little ripples go out every which way. Then I drove several twisted streets and miles home through the city and never saw a red light – 20 green lights in a row. That never, ever happened to me! It could have been a Karmic echo of one of those ripples... I don't know how that works but I think it does. Share your story of kindness here.